This past Saturday I had a priviledge to see the Met's new exhibit, Impressionism, Fashion, and Modernity, which officially opens February 26. This is a most wonderful exhibit that one could spend hours viewing. To quote from the Members Calendar description, a revealing look at the role of fashion in the works of Impressionists and their contemporaries.... It is an extensive exhibit with over 80 paintings that are viewed along with period costumes and fashion plates. It was absolutely wonderful to have actual costumes used in some of the paintings present. 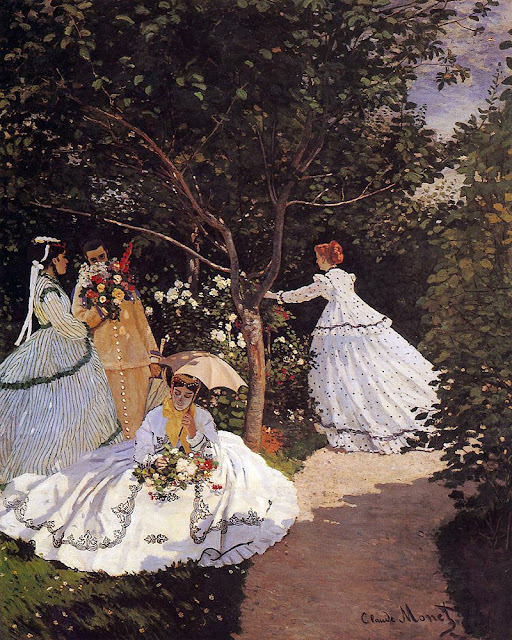 I have always loved the paintings of Monet, Manet and Renoir and never tire of viewing them. This time, due to the nature of the exhibit, my attention was really drawn to how the artists achieved the incredibly realistic look of fabric through paint on canvas. The subtleties of the layers of shading, along with the intricate detail, have always been there. I just never quite focused upon them. The exhibit will continue until May 27. I hope that you will be in the New York City area this spring and able to view in person. There is also an extensive book on the exhibit available through the Met store after the exhibit opens.